To have every individual and business working safely and in full compliance of all OSHA Standards and Regulations. To provide the best and most affordable forklift training solutions, allowing our clients to achieve their personal and professional goals by providing the tools and knowledge necessary to form a foundation in safe work practices and comply with all Federal and State Standards and Regulations. To establish, maintain and conduct honest and ethical relationships with our clients, business partners, employees and community. We are committed to the principle that quality, integrity, mutual respect, trust, and teamwork are paramount in all business decisions. 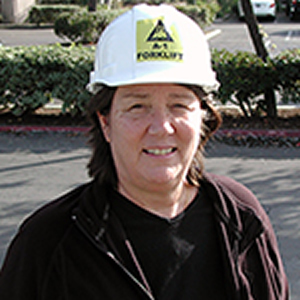 Donna Fauscette is the founder and managing director of A-1 Forklift Certification. During her 30-year career working for the largest package delivery company in the world, Donna served in operations and training for 30 years. She ran a package distribution center with 60 drivers, ensuring all packages were delivered on time, daily. Five years ago, before recently retiring from her full-time position, Donna decided to start her own forklift training and certification company. "I love people and training. I get a lot of personal satisfaction from watching people learn and teaching them a trade that helps them to enjoy a secure future," she says. In addition, Donna founded her company on the principle that safety must be a way of life. "At the end of the day, ourselves and our families are our most important stop," Donna says. She adds that she built A-1 Forklift Certification on the premise that all training would exceed OSHA requirements, emphasizing "Safe by choice, not by chance." When Donna isn't spending time training or strategizing on leading-edge ways to help companies ensure workplace safety, she is indulging in anything that has to do with tennis. As an avid tennis fan, Donna enjoys watching the pros play on TV or on the court. In her spare time, she enjoys crossword puzzles and Sudoku. The lead trainer for A-1 Forklift Certification, Shelly Graham developed her training skills while working in human resources and training and development for a manufacturer and retailer of customized window coverings. Eventually, she and Donna became coworkers at the world's largest package delivery company. It was there where Shelly became health and safety supervisor, learning the importance of the field to each and every employee. Shelly came to A-1 Forkllift because of the company's dedication to "the same standards of excellence and commitment to safety" as she is. "It was important to me to work with a company that shared that passion," she adds. In her role for A-1, what Shelly loves most is being able to help students gain the training and experience they need to improve their lives. "The skills that they develop make it possible for them to find new jobs, to earn better wages, and ultimately to be able to support themselves and their families," she says. In her spare time, Shelly enjoys sports. She's played soccer for almost 30 years and loves the Dodgers and college football. Based in Anaheim, California, A-1 Forklift Certification provides high-quality online forklift certification, on-site courses, hands-on training, aerial lift training and train-the-trainer courses. Our team has more than 30 years' experience in forklift operation and warehouse management. Earn a better living. Start a new career. Ensure optimal workplace safety. Let us help you to comply with OSHA regulations and get certified. Shop now. Copyright 2019 . A-1 Forklift Certification. All rights reserved. Website by Marcus.Webmaster and Judy Asman Communication.